Everything you’ve heard about Australia is true: the beaches are gorgeous, the people are friendly, and Aussies really know how to appreciate their beautiful coast, especially around the holidays. This is a huge, very flat country, and the effect of all that flatness is that it makes the land seem even more vast, since you can see so very far across the landscape without all those pesky mountains blocking your view. 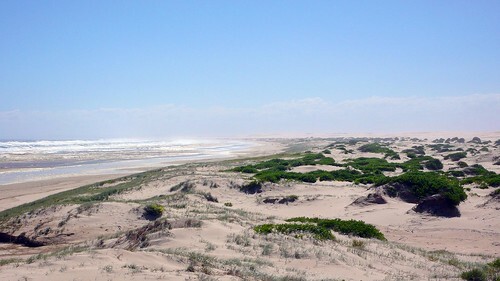 Sand dunes near Nelson Bay. Australia is pretty much the same size as the US (with only 5% the number of people), and we only saw the east side of the country, but still we were impressed by how much the states differed, especially in relation to the coastline. 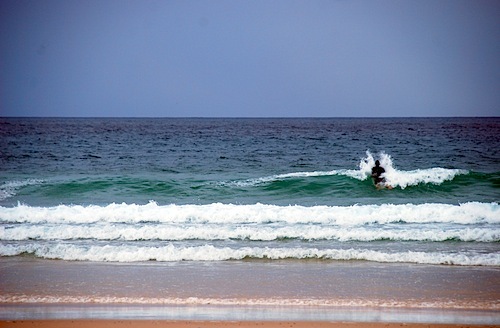 In New South Wales, it was all surfing all the time: pristine waters, big waves, vast beaches, and clear skies. In Melbourne and the Great Ocean Road, it was rocky coastline (sometimes it looked more like New Zealand than Australia), turbulent surf, and cold, cold water. And finally, in Queensland, the beaches were muddy, the sky was overcast (we were there during the stormy season), and the water was filled with deadly creatures (crocs and jellyfish). In fact, sometimes it feels like we visited three different countries, kind of like how it might feel if you visited California, New York, and Florida, for instance. Beach near the 12 Apostles on the Great Ocean Road. And finally, it’s true: Aussies really are super friendly, generous, and fun-loving people. We met a lot of new friends here that had no hesitation hanging out for a day or evening with two complete strangers (that’s us), and showing us all the hidden gems in their respective cities. We were so impressed with Aussie hospitality, hopefully that’s something we can bring home with us. 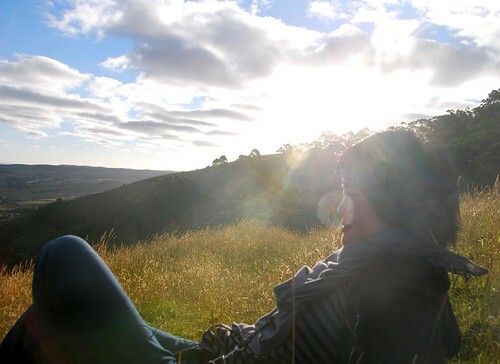 Prices: Accommodation was quite expensive in Australia, we typically spent between US$70 and US$125 per night here. Everything else is pretty equivalent to US prices, perhaps a bit cheaper due to a favorable exchange rate. Internet access is not cheap, except in Melbourne. Weather: Australia is known for its sunny weather, and indeed, it is quite temperate in Sydney (between 80 and 90 degrees F most of the days we were there), growing hotter and wetter the further north you go, and logically, colder the further south you go. We were surprised at how chilly it could get in Melbourne…the weather is also quite unpredictable there (”four seasons in a day”). Sunny but cold up on Mariner’s Point in Apollo Bay. Places we visited: In New South Wales: the coast from Sydney to Byron Bay; in Victoria: Melbourne and the Great Ocean Road up to Apollo Bay; in Queensland: Cairns to Cape Tribulation. Highlights: NSW: Valla Beach (the water was SO clear here), Yamba, Crescent Head, Pacific Palms, sailing in Sydney; Victoria: Fitzroy district and the laneway bars in Melbourne; Queensland: the Great Barrier Reef. 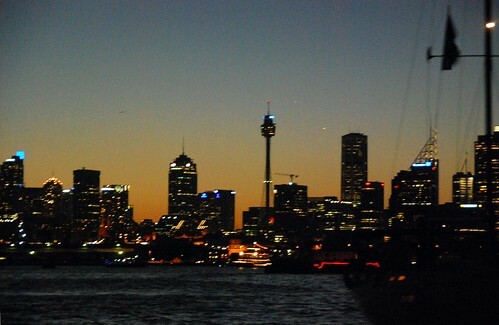 Sailing on New Year’s Eve in the Sydney Harbour. 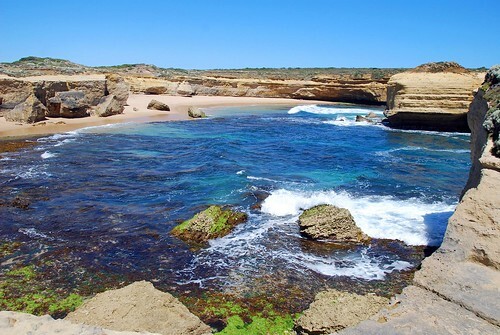 Places we want to see next time: The west coast of Australia, esp. Perth and south of Perth (we hear it is really beautiful and serene there), Darwin. Phrases we never heard an Aussie say: “Crikey,” “g’day,” “shrimp on the barbie” (they refer to those delicious crustaceans as prawns…”shrimp” are tiny little things that would fall through a BBQ grate; and Aussies just say “barbeque,” like Americans do). Phrases Aussies really do say ALL THE TIME: “Mate,” “How ya goin’?” (standard greeting), and “No worries” (the standard response to an apology or expression of thanks). Our favorite Aussie slang word: “Bogan” (American equivalent of “redneck” or “hick,” kind of affectionate and derogatory at the same time, taught to us by Jackie in Melbourne. We love this word! 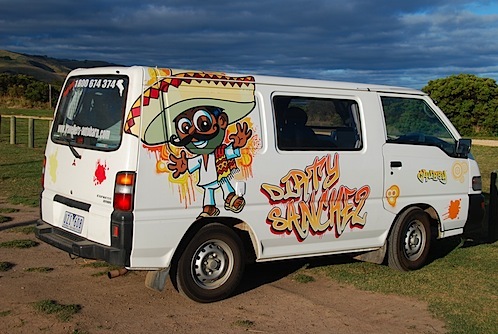 And yes, we met many bogans on our trip). Aussies and their sport: Oh my, do Aussies love their cricket. This is a very confusing game to us…it can last up to 5 days, there are all sorts of strange rules, and the point of the game is to knock two little pegs off of 3 vertical sticks. During our stay, we got a general idea of how the game is played, but we were not infected with cricket mania. Aussies and their booze: Yeah, the rumors are true: Australians really know how to drink. First of all, each state has a beer of choice…in NSW, it’s Victoria Bitter (or VB), Melbournites seem to drink more wine than beer (though their local brewery Bright Creatures makes a mean bright ale), and in Queensland, it’s all XXXX, all the time (nobody but Americans drink Foster’s as far as we can tell). In addition, if you walk into a bar, you can’t just order a pint…there are all different size glasses that go by very undescriptive names like “pony” and “schooner.” Even more confusing, a “pony” in Queensland can be a different size than a “pony” in Victoria. 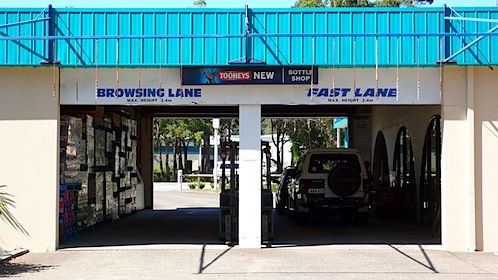 At the bottle shop (liquor store)…you can jump in the “browsing lane” or the “fast lane” if you’re in a big hurry to get your drink on. We also heard about (but never witnessed) a ritual called “Sunday Sessions.” Basically, people of all ages start drinking at 10AM on a Sunday and don’t stop until they are passed out on the ground (usually in the early evening). Just another way that Aussies enjoy life to its fullest, we suppose. Aussies and their feet: Wow, Aussies have tough feet. Seriously, everyone walks around barefoot like it’s no big deal. We tried this a few times and ouch! The sand is hot and the rocks are sharp! But really, everyone from little kids to old timers walk around on every surface without trouble. We’ll keep our flip flops on, thankyouverymuch. Aussies and their giant fiberglass food products: On our drive up the coast of New South Wales, we saw a giant fiberglass banana near Coffs Harbour, and a giant prawn (REALLY giant) on the roof of a restaurant…somewhere else (we forget where it was). We’ve also seen photos of a giant pineapple in Noosa Head. There’s even an billboard featuring all the different giant food items. I don’t think we’ve ever been to another country where there were so many giant fiberglass foods. Internet: Australia has a telecom monopoly going on (Telstra), and the result is that internet access is expensive and slow. We were quite surprised by this…we thought a first-world country like Australia would surely have fast, cheap access for its residents in order to keep it competitive in the world. Unfortunately, this is not the case…we have had better access in New Zealand and Asia. The friends we met/visited here tell us tales of confusing Internet plans that allow a certain amount of traffic a month and then once that allotment is met, access is either cut off for the month or it becomes excruciatingly slow. The one exception is Melbourne, where wi-fi was readily available for cheap or free. Food: Overall, the food in Australia was good, but not amazing. We mostly cooked for ourselves the 2 weeks that we were in a camper and for the week that we had an apartment in Sydney. The meat and produce was all fresh and good, although selection was at times limited. We ate out a few times in Sydney and had one exceptional meal at an Indian restaurant, some of the best Indian food either of us has had. We hear that there are some fantastic restaurants in Sydney, but unfortunately, we had to skip for budget reasons. I guess that means we will have to come back. Kangaroo meat is the big eco food in Australia, kind of like bamboo for flooring in the US. Kangaroos are plainly abundant in many parts and the meat is very lean. We have to admit, we were too squeamish at the time to try any. Some Aussies we spoke with refused to eat it. Others said “its not that bad”. Probably tastes a bit like venison. 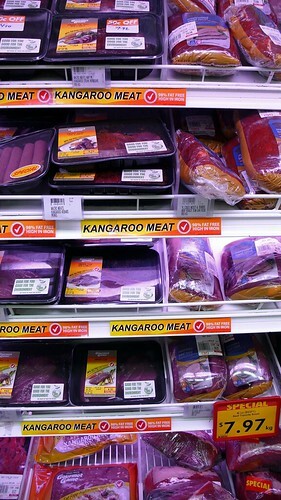 Kangaroo meat for sale at the supermarket. Surf: The surf in Australia is, not surprisingly, amazing. On the East, South, and West coasts, there are endless beaches, points, and reefs with great waves. As long as there is a swell in the water, there will be a spot nearby that works with the current wind and tide. It is no wonder that Oz holds the spot that it does in surf lore. Jeremy heading out for a session off Angourie Point. The downside is that with great waves come lots of surfers—and in this case, lots of amazing surfers. Everyone seems to surf, and they all rip. The average surfer at a break in Australia would probably be one of the better surfers at a comparable break in the US. It’s fun to watch, but it is a little intimidating out in the water. Fortunately, the breaks that we visited had plenty of waves for all, so the vibe in the water was not at all negative. There are definitely sharks in Australia and the guidebooks all make references to sightings and attacks. But, as is the case in shark infested Northern California you are pretty unlikely to have a problem. Car accidents and apparently falling coconuts are a much more real danger. But I was happy that an unusual and highly publicized string of 3 or 4 attacks in NSW in late 2008 happened right after I sent my surfboard home. In Short: We’re glad we finally got a chance to visit this big island down under. If it’s a beach vacation you’re after (perhaps interspersed with some visits to a few world-class cities), Oz is your place! But for us, we enjoyed the people we met here more than the landscape—don’t get us wrong, we LOVED the swimming in the ocean and seeing life in Sydney and Melbourne—but it’s all beaches, all the time, and it seems the personalities we encountered varied more than the landscape did. Your web site is splendid I will have to read it all, thank you for the diversion from my homework!